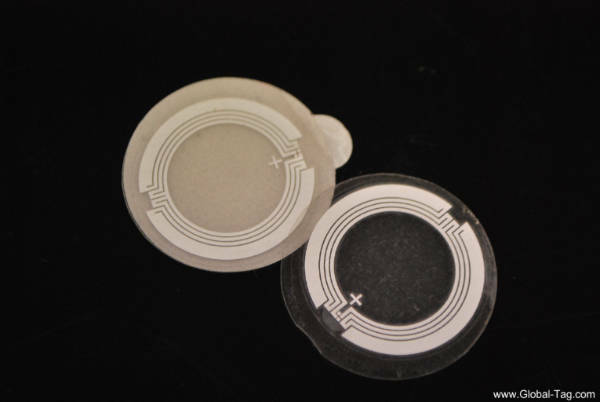 The customization for an RFID or NFC tag often leads to an RFID project success, and it’s one of the most crucial choices to do. That’s why we always based our philosophy on the design and on the realization of custom RFID tags. Along with the development and growth of the RFID technology, the application environments also have grown and the need of customization for the components of the RFID(and NFC) had born. In particular, the market became more selective on the seek for the perfect RFID transponder. Starting with these needs, Global-Tag has built his philosophy around a varied catalog of standard products, along with the capacity of planning and realizing custom RFID Tag(tailor-made). In this section, you’ll find some solutions developed to satisfy the needs of RFID’s projects, which without these customizations they would have failed. Application: Identification for spent oil tanks. Development: An UHF inlay has been developed with a circular antenna and a PET’s double-layer has been made to protect the antenna and the chip. Lastly, a 3M strong adhesive layer has been made for an easy application. RFID LF Tag for application on ABS container which has integrated other electronic components. 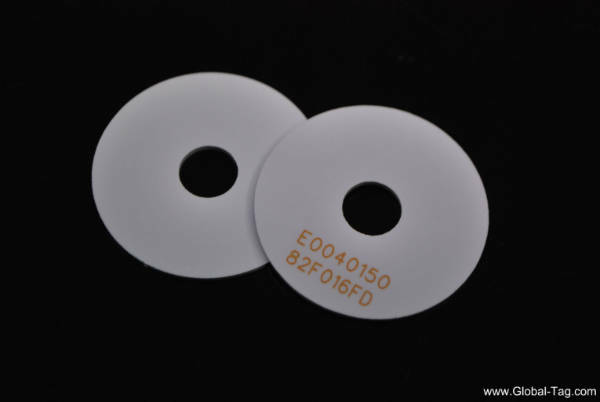 Application: RFID LF Tag for access controls. Necessity: The Tag needed to be situated on an electronic device capable of locating company employees. Development: On customer’s demand, a new mold has been made(by .stp file). A new Antenna has been made with specific dimensions to be able to read at the distance of 4cm, and an insulating layer has been put between the RFID Tag in PVC and the ABS container. 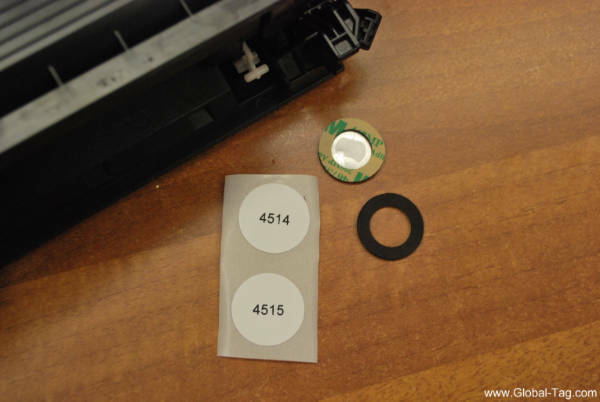 In the end, the application needed the use of 3M 467MP sticker. RFID UHF TAG FOR THE GREEN ENVIRONMENT’S MANAGEMENT. 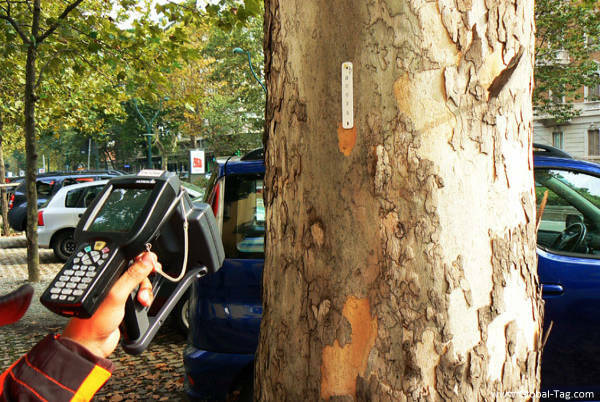 Necessity: Finding an RFID Tag able to resist in the open space, able to be ridden on a tree at 4/5meters distance and capable of being fixed without damaging the plant. It also must have the possibility to have a progressive code printed on it. 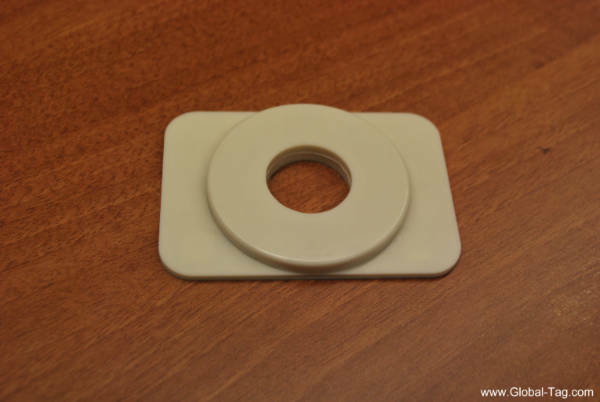 Development: A silicone RFID Tag has been made with 2 holes for an easy fix for both nail and cable tie. It also has been integrated with an Alien Squiggle inlay which ensures long reading distances over 5 meters. As a result of the numerous requests of this tag, we added it to the catalog and we called it Patchy. Application: Tracing kids in Hospital clinics. Necessity: This project required an RFID HF ISO15693 Transponder with LRi2K single-use and hypoallergenic chip with extremely compact dimensions that can be applied on childrens. 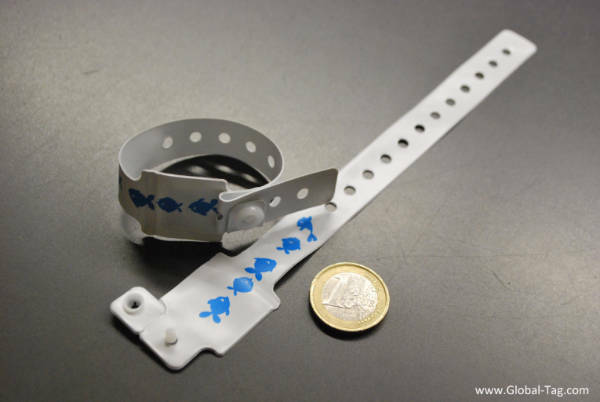 Development: We’ve chosen a tag made of soft and hypoallergenic material integrated with a tag of counted size(18x18mm) and characterized by a shape that fits well on a children’s wrist. Everything has been made more graceful with a print of some fish on it. Application: Identification of metal assets. Necessity: This project required a robust RFID UHF Transponder for outdoor environments and with the possibility to be removed when the asset was sold. Development: We decided to go for a tag already present in the catalog which fit perfectly with our needs of toughness. We evaluated the possibility of applying two magnets with a holding capacity of over 2Kgs on the foamy side of the tag, glued with a permanent and extra strong 3M sticker. Such solution has been inserted in the catalog as optional. Application: Ribbon identification for thermal transfer printers. Necessity: The project required an RFID HF Transponder with a spacer that could be applied in a particular slot. The normal label didn’t respond to the project needs. The project also required specific certifications regards the used materials. Development: We developed a spacer with a 24mm diameter and a thickness of 1,5mm, with a 15mm diameter central hole and a strong permanent sticker 3M. 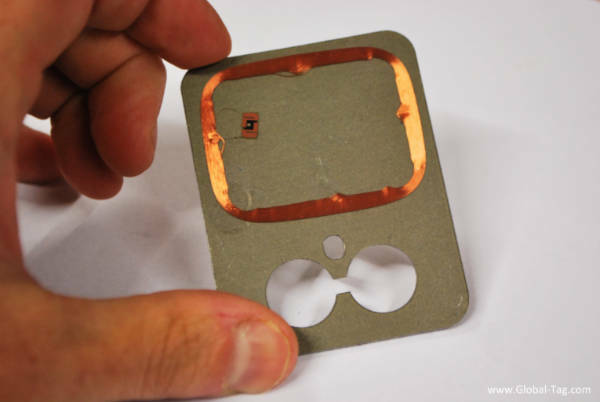 This spacer was assembled on a 25mm label with an I-CODE SLIX chip. The tests required a 6 months duration before the product could be verified. 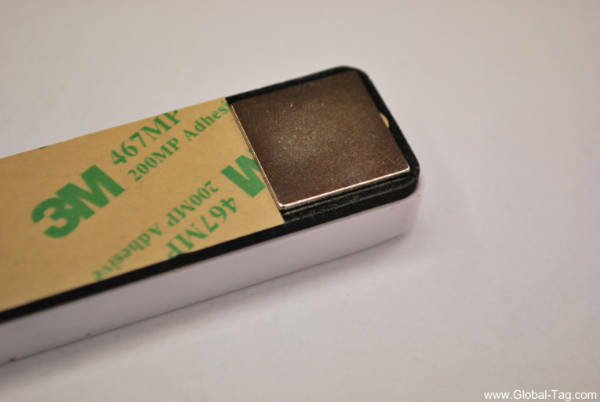 Necessity: The project required a strong RFID UHF Transponder which it could be applied to the stamp’s tools. (The stamp of the gallery blocks). Development: We developed an ABS Tag with a central hole that had the dimensions of a thumb, and we have inserted a performant UHF inlay at the right distance from the gallery block. Application: Identify and trace special fabrics during the production. Necessity: The project required a strong HF RFID Transponder resistant to a process using chemical and high temperatures. There was the need to have the UID code of the I-Code SLIX chip printed on it and lastly the application of the tag had to be done with a rivet.